2014 has been another extraordinary year in the life of CFTC thanks to you–our generous, compassionate family of supporters. Thank you for all you’ve done in 2014 to help children thrive! 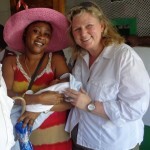 As I write to you, we are at long last poised to see OMES open the doors to their new maternity ward in Thor, Haiti. Like many projects in Haiti’s extremely complex development environment, this one has been two steps forward and one back all year. My visit to OMES in May, 2014 was bittersweet as it was then that we formally brought our relationship to a close, with our commitment to fund OMES until their new clinic achieves its operating license (expected any day!). OMES is now in a position to self-fund their new maternity clinic and provide thousands of women and children in Thor with reliable, accessible, quality pre- and post-natal care. Medical staff have been hired and trained for the new maternity ward at the OMES clinic in Thor, Haiti. During that same visit, we laid the foundation for transitioning away from House of Hope Orphanage at the end of 2015 as they also take the next steps on their journey to become self-sustaining. We are accompanying them as they put in place a new governance and management structure that will serve them well into the long term. When one door closes, a window opens. 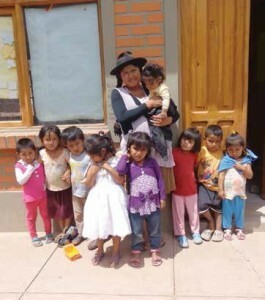 We have expanded our Sponsor a Child program in Bolivia with Tomás Katari Politecnic Institute (IPTK) in the underserved rural areas around Sucre where there is deep poverty among the primarily indigenous residents. 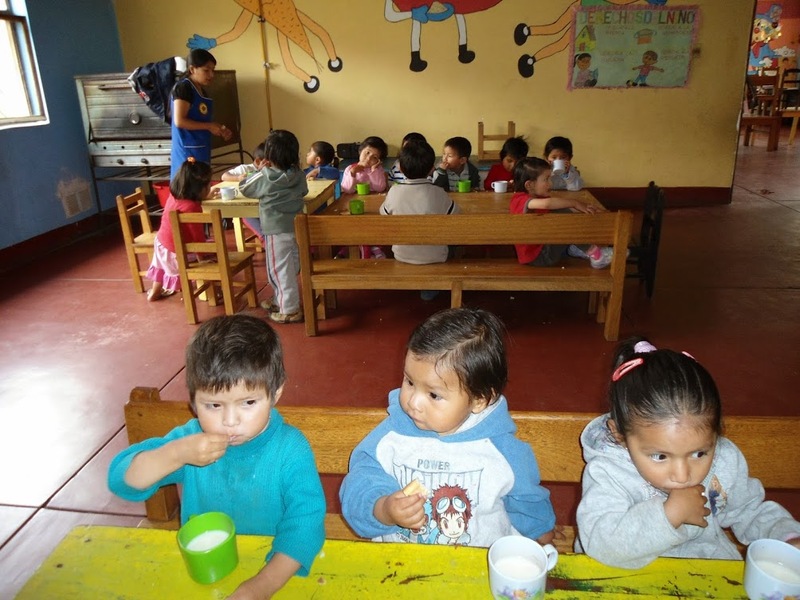 The newly-sponsored children live in the communities of K’acha K’acha, La Baraanca and Sojta Pata in the mountainous area around the Bolivian capital city. Although IPTK has historically served mostly urban or suburban areas, CFTC has worked with them to open more centres in rural areas. The goal is to make quality education and nutrition for children more accessible and reduce the flow of migration to cities where services and employment are no more plentiful. Teacher Agripina Caballero and some of the newly-sponsored children at K’acha K’acha school. This additional support means that children at these early childhood care centres and in the newly-built primary school will not only continue to receive healthy meals and a good education, but CFTC will also be able to strengthen our support for IPTK to hire and train local residents, like Agripina Caballero pictured at left, to work at the early childhood care centres and primary school. This aspect of the work is key to sustainability: it reduces the challenge of enticing urban teachers to stay or move to these remote communities where there is no guarantee they will stay for any great length of time, builds competencies, and offers the possibility of employment and long-term, self-managed community development to local residents. CHANGE (CFTC’s Climate Change Adaptation in Northern Ghana Enhanced project) continues to grow in Ghana. As we complete the second year of the project, we are seeing great traction in terms of women’s participation and empowerment. Funding from Canada’s Department of Foreign Affairs, Trade & Development came to an end on September 30, 2014, but CFTC has committed to an extension phase that will continue until the end of 2015. The extension is critical to ensure that momentum achieved during the first two growing seasons, which is helping to close the hunger gap for children, can be maintained and escalated in the face of the growing impacts of climate change. 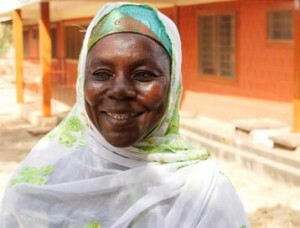 Fairuza Sulemana leads a farmer-based organization in Zoosali, Northern Region, Ghana. As just one example of how CHANGE is making change, men in the Northern Region expect farm yields to increase from 3.5 bags per acre to approximately 15 bags per acre this year, while women farmers expect their yields to increase from one to two bags per acre to up to ten bags per acre. The dramatic improvement in women’s yields is a clear sign that one of the most important CHANGE strategies is having a demonstrable impact on agricultural production. Women are participating at increasing levels in farming activities; they are gaining the knowledge they need to boost their own productivity; and they are being recognized for the value they can contribute to household and community food security. As the impacts of climate change intensify, the ‘hunger gap’ – when food is scarce and meals are reduced sometimes to one per day – is stretching from weeks to months and resulting in much higher levels of under-nutrition among, in particular, children in northern Ghana. As CHANGE works to build resilience and reduce climate risks in communities for the long term, this increase in production, especially among women, means that there is more to sell and more to eat to help families bridge the gap in the short term. And speaking of women’s empowerment, our Ethiopian partners have continued their ground-breaking and life-changing work supporting women’s self-help groups. 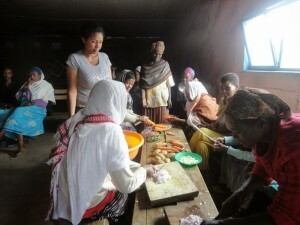 A great many of these women are engaged in these groups at the time their children are selected for child sponsorship. Women’s self-help groups have proven to be an excellent venue for nutrition education, helping to forge stronger links between increased income and better children’s nutrition. Self-help group members attend a hands-on nutrition education session with nutrition educators from CFTC local partner, MCDP. CFTC’s local partner in Addis Ababa, MCDP, is sponsoring a multi-media public education campaign raising awareness of healthy nutrition and the food pyramid. Billboards are displayed prominently in some of Addis Ababa’s most impoverished areas, and key messages are being delivered through hands-on nutrition education sessions provided to women involved in MCDP-supported self-help groups. Complementing livelihood supports and agricultural training for women with nutrition education is a development best practice designed to strengthen the relationship between increased income and better childhood nutrition and health. Through its partners like MCDP in Ethiopia and increasingly in Ghana and Uganda too, CFTC works with families to ensure that household income is spent in a way that directly impacts the quantity and quality of the food the family is able to eat, especially children or other vulnerable members of the household. Our work in Canada has also made important strides forward, culminating in the first-ever CFTC-organized food security forum in New Brunswick: Nourishing Food, Nourishing Knowledge on November 18-19, 2014 hosted at Elsipogtog First Nation. 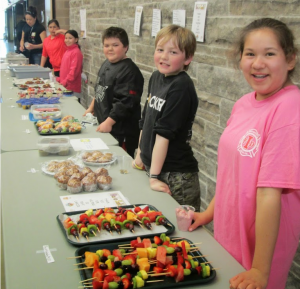 Cape Croker students proudly show off their healthy bake sale items – just one of the many fun activities that teach students about healthy eating. In Ontario, we were thrilled that Scotiabank committed to a third year of funding for the Chippewas of Nawash Unceded First Nation, which will enable that program to grow its nutrition education component. The school food program has been embraced by the community and continues to reach more people as it heads into its third year. The three-year plan is intentional about creating community mobilization and engaging the different resources that exist in the community. For example, planting a community garden is a great first step, but there needs to be additional learning and practice planting, maintaining, harvesting, and using the crops to cook certain meals. This is what makes a school garden and nutrition program sustainable for and by the community. Thanks to your support, CFTC is playing an important role bringing these agencies together to leverage their expertise. Coordination among agencies is widely recognized as essential to continue to improve the school food program, reach more members of the community with nutrition education, and advance the health and well-being of the entire community, and it’s something that CFTC places a special emphasis on as part of our capacity-building strategy to drive long-term, high-impact development in all of our communities, domestically and internationally. At this time of year, it brings us tremendous joy to share with you the impact you are making on children’s lives around the world and to thank you for another year of compassion and support. On behalf of all of us at CFTC, we wish you and your families the very best of the holidays and a 2015 filled with peace, joy and love. Thank you for your ongoing support to help children thrive.